Pellegrino Tibaldi, also known as Pellegrino di Tibaldo de Pellegrini (1527 – 1596), was an Italian mannerist architect, sculptor, and mural painter. Tibaldi was born in Puria di Valsolda, then part of the duchy of Milan, but grew up in Bologna. His father worked as stonemason. He may have apprenticed with Bagnacavallo or Innocenzo da Imola. 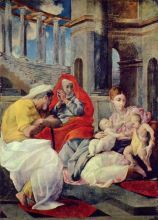 His first documented painting was likely as at 15 years of age, a Marriage of Saint Catherine. In 1547, he went to Rome to study under Perin del Vaga. 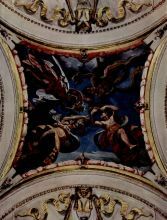 He was employed in the decoration of the Sala del Consiglio of Castel Sant'Angelo. When Perino died in 1547, Tibaldi became the leadership in the large scale fresco painting of the chambers and doorways (1547-1549). 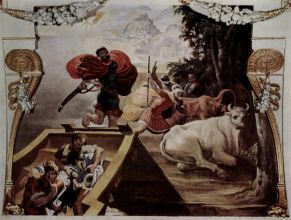 The frescoes are described as Michelangelesque in influence. 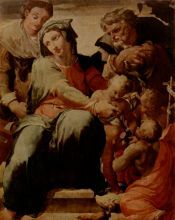 Other works were for Cardinal Luigi Poggi in Bologna, and he carried out numerous commissions for him . 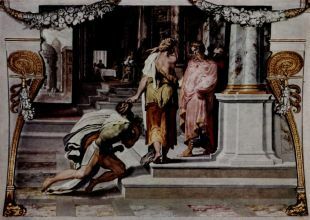 Tibaldi painted frescoes of the Story of Ulysses in the Palazzo Poggi , scenes from the life of the Baptist in the Poggi chapel, and scenes from the Life of Moses in the Palazzo Sacchetti in Rome.